Today we welcome guest blogger Chloe Dutschke a young girl who loves her job working on a sheep station in the Flinders Ranges in South Australia. Chloe is committed to showing the world that there are career pathways in the wool industry that welcome creative individuals with a diversity of knowledge. Hi Guys, my name is Chloe Dutschke and I’m 22 years old. I sometimes wish I was raised on a family farm, but truthfully I’m a country girl who grew up on 8 acres in The Clare Valley wine region of South Australia. Growing up we had an assortment of pets including chickens, sheep and of course horses, but my favourite was our pet pig Sid. I have always had a love for animals (yes I’m the soppy kind who cries in the movie Red Dog) which has led me on an amazing journey, and got me a job that I love, on a sheep station in the Southern Flinders Ranges, SA, developing my newly discovered passion for wool production. My story starts on a family friend’s white Suffolk stud in the Riverland, SA. My sisters and I spent many weekends in the ute checking on the sheep, especially at lambing time. I loved driving through the mallee scrub, watching the ewes feeding small white lambs, and seeing their happy little tails wiggling while drinking. I soon turned from the passenger to driver, and on visits from Clare, would zoom through the sand dunes rounding up the sheep or catching lambs for marking. Ram sales were another favourite. I’d spend all day watching the farmers choose their bids and cross check their programs as the next ram entered the ring. Listening to the auctioneers chaotic spiel, engaging the crowd and seeing them pick up on the smallest flick of a card was always exciting and would send me into a panic each time I raised my hand to shoo a fly, scared that I’d make a bid! It was in year 7 that I started to develop my interest in agriculture. I loved ag class and only doing a semester each year was not ideal, but I worked really hard and enjoyed every moment of being out in the veggie garden, cleaning out the pig eco shelter or feeding the layer chicks. The highlight for me was definitely attending the Royal Adelaide Show. 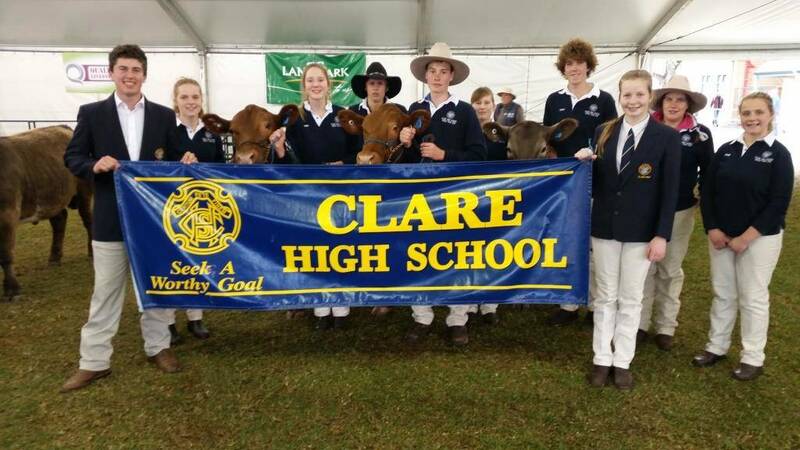 Every year Clare High School takes goats and steers to the show and participates in the led and carcass competitions; this is highly competitive amongst students and the best fun! I was a part of the goat team in year 10 and the steers in year 11. I loved every moment of being a part of this team; it was a great way to learn responsibility around animals and obviously got you 4 free days at the Royal Adelaide Show. By year 11 I had decided I was going to study Animal Science at university and had to give up my beloved ag class to pursue my prerequisites of maths, chemistry and biology. What a drag those subjects were, but it all payed off ,and in 2012 I packed my bags and moved to Adelaide to start my Bachelor of Animal Science at The University of Adelaide. When I started university I had a real passion for wildlife. I wanted to be a zoo keeper that saved endangered animals. Throughout university, my passion for wildlife took a back seat as I developed more of an interest for livestock production. I studied a mixed bag of subjects including nutrition, welfare and ethics, anatomy, health, genetics, reproduction, livestock and many more. Whilst each subject opened new thoughts to what I could do in the agriculture industry, I could never quite make up my mind, about which area I would like to pursue as a career. My last year of university was the best by far; I participated in The Intercollegiate Meat Judging Competition, where I was part of the team that came 4th in the placings category. We competed against other universities in Australia as well as international teams such as America, Indonesia and Korea. This was a great week long program where I learnt so much about consumers and got a real idea for what I could do in this industry. In November I was also lucky enough to go to Indonesia for a 2 week study trip, primarily looking at the live export industry. We visited feedlots, abattoirs, community projects, and The Bogor Agricultural University as well as many other interesting places. Going to Indonesia helped me understand the live export industry and it really hit home the amount of consumer misconceptions within the Australian public. For me, I went to Indonesia with my own unrealistic views of the industry and it has been worthwhile to see the industry first-hand and now be able to generate my own opinions and views on the topic. Fresh out of university and still unsure of exactly what career path I wanted to take, I successfully landed a job on a sheep station north east of Orroroo, SA. My first day on the job was on January 5th 2015, I was thrown straight into shearing and crutching, the busiest times for a sheep producer. I was asked to roust-a-bout, and was well and truly in over my head trying to throw fleeces, skirt and press. As I stood at the table skirting the wool, running my fingers along the fleece, I really began to appreciate the wondrous fibre that wool is. I love the feel of wool between my fingers and how each fleece can differ in length, micron, colour and strength between breeds and even ages of sheep. It’s amazing to think that a burr covered sheep which has been grazing only on pastoral land can produce such a soft clean fleece. Since my first day I have been furthering my knowledge about wool and how to breed and grow sheep to produce the best wool possible. I’m not really sure where I‘m heading in this industry, whether I would like to become a wool classer or continue on stations, but the opportunities are endless and eventually I know I’ll find the right fit for me. For now I am super excited to develop my passion and continue to educate myself as much as possible about this remarkable fibre that many generations have developed before me. Previous Previous post: WANT TO TELL YOUR WOOL STORY TO THE WORLD?